Math is not my strong suit, and I knew that drafting my own sewing pattern would involve math, so I wasn’t sure I’d be able to follow along with Cal Patch’s Pattern Drafting class. But, she makes it really easy! I made my pattern when the class first came out, but I just got around to sewing my muslin together. 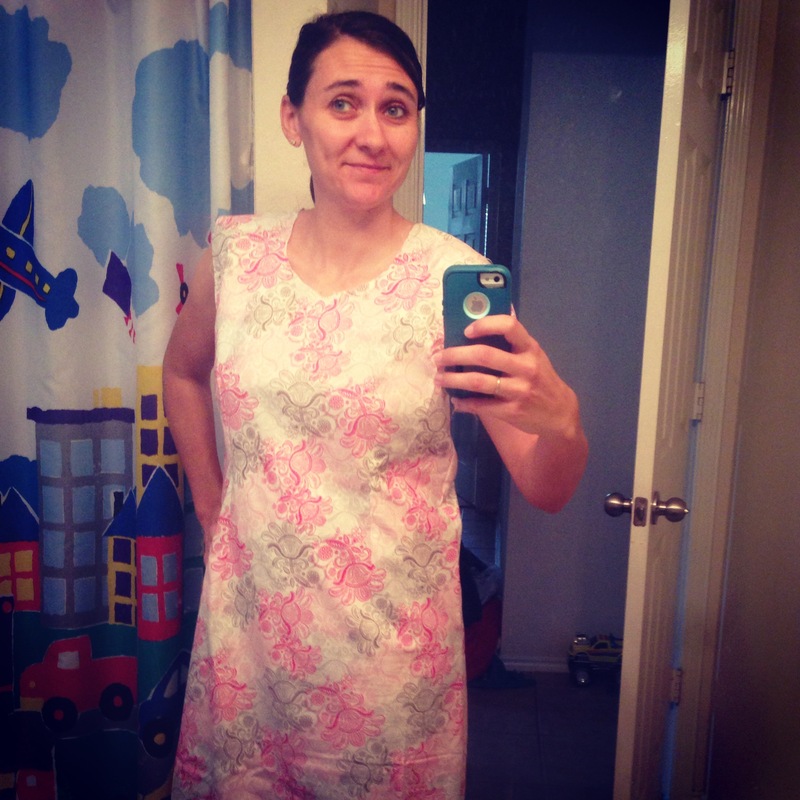 I did a dress, and just put one short sleeve in. My sleeves were kind of a mess, so I didn’t do the other one, yet. I didn’t measure the sleeve cap correctly to make it match up, so I’m going to have to work on that. When I do sleeves for real, I’ll extend the length of my short sleeve, too. I followed the instructions to do the front and back darts. I’m kind of unsure if I’ll incorporate darts into my final garment, but I’m really glad I learned a bit about how they work. I’m pretty sure I won’t incorporate front darts into it. I took them out and I like the muslin better without them. I’m still deciding about back darts. My hips and my shoulders are crooked, so it complicates things. I feel like it makes the back darts lay funny (or maybe I didn’t sew them well?). I don’t really want to make the darts/shape fit my crookedness because I don’t want to draw attention to it, so I’m not sure. On the flip side, I don’t want it to be too loose. If there are any dart suggestions, I’d love to hear them. Maybe I should make the darts not as wide & therefore less pronounced? Overall, I am really proud of my muslin & I know I’ll be using this pattern. I am anxious to watch week 3 & hear about some possible modifications. I am hoping to knock out a sleeveless dress using this pattern this weekend. We’ll see what I can come up with! Keep at it. Sewing is totally fun and can be pretty easy if you let it. (Plus you can sew garments you can actually wear in hot hot Houston! OK these suggestions have no actual sewing know-ho merit, but to my eye, it looks like the back darts need to be moved inward, more toward the center of the back (I mean in that direction, I don’t mean in the center) — maybe they’re too close to your sides? b/c there’s too much excess fabric up above them? looks like it fits from waist/darts downward but too big on top?